Danica Harbin likes horseback riding, swimming and reading. She also plays violin and sings in the school choir. “She’s not afraid to try things,” said her mother, Jeannette Harbin of Grove City. That can-do spirit helps explain why Danica entered this year’s Connells Maple Lee Flowers & Gifts Kids Club birthday card contest. “I just wanted to see if I could draw, really,” Danica said. In fact, the seventh-grader submitted the winning entry. Her design will be featured on the electronic card that kids club members will receive on their birthdays in the coming year. Danica’s prize is a free flower delivery on her next birthday. The kids club is free to ages 5 to 12. 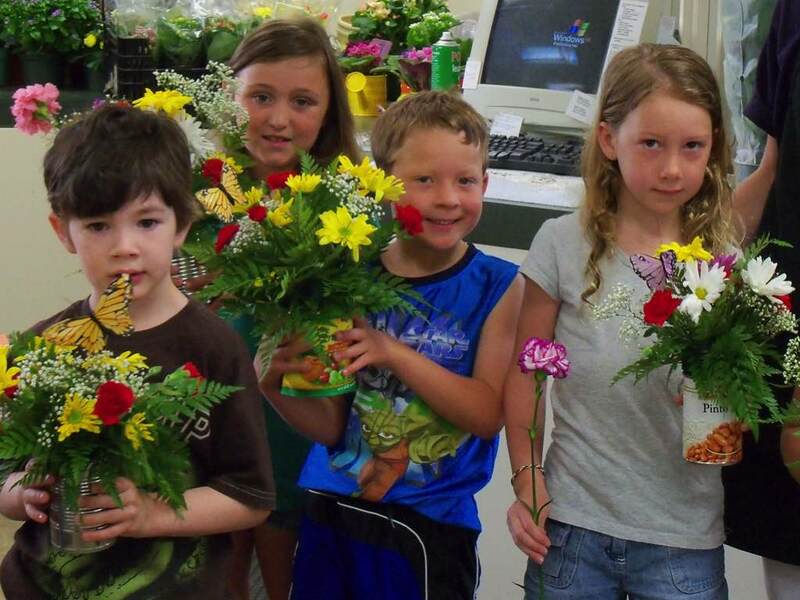 With parental permission, children may register for the kids club at any Connells Maple Lee store or online at cmlflowers.com/kidsclub. Membership benefits include a membership card, website activities, an e-mail newsletter, contests and in-store events. Pansy Geiger, designer in Bexley, with her store’s Stems Hunger display. Connells Maple Lee Flowers & Gifts’ annual food drive collected 120 pounds of nonperishable items for the Neighborhood Services Inc. Food Pantry in Columbus. Connells Maple Lee Stems Hunger took place June 16-30. Besides Connells Maple Lee’s three Columbus-area stores, the food drop-off locations included Drayer Physical Therapy Institute’s outpatient centers in Grove City and Hilliard. Donors received a free carnation for each nonperishable food item they contributed. In its seven-year history, the food drive has collected more than 1,100 pounds for area food banks. That’s because we’re in the midst of our annual Connells Maple Lee Stems Hunger food drive to benefit the Neighborhood Services Inc. food pantry in Columbus. Please consider donating at our stores in Bexley, Grove City or Powell. A big thanks to everyone who joined us for the June 16 Connells Maple Lee Kids Club event. Not only was it a fun time, but it also helped us kick off our annual food drive, Connells Maple Lee Stems Hunger, which runs through June 30. We wish you a happy, safe summer and look forward to getting the gang back together for two more events this year: Aug. 25, when the theme will be fall, and Nov. 10, when we focus on our Bouquets for Books children’s book drive and our Holidays for Heroes card and coloring page drive for active and retired military members. Meanwhile, if you haven’t officially joined the kids club, or if you have a friend or family member who might be interested, please click here for complete details. Our annual food drive – Connells Maple Lee Stems Hunger – returns June 16-30. Connells Maple Lee Stems Hunger will benefit the nonprofit Neighborhood Services Inc., which operates the Choice Food Pantry at 1950 N. 4th St., Suite J, Columbus. For the food drive, donors will receive a free carnation for each nonperishable food item they contribute (limit six per visit). Donations may be dropped off during regular business hours at one of Connells Maple Lee’s stores: 3014 E. Broad St., Bexley; 2033 Stringtown Road, Grove City; and 8573 Owenfield Drive, Powell. Meanwhile, the Connells Maple Lee Kids Club is helping to kick off the food drive June 16 with an event in each store. Participants are asked to bring a food item as the price of admission. Our annual food drive — Connells Maple Lee Stems Hunger — returns June 16-30. The Connells Maple Lee Kids Club will kick it off with an event June 16 in our three Columbus-area stores. Roses are most closely associated with Valentine’s Day, but they are available year-round. They’re a particularly good value in June thanks to the natural rose growing cycle, as evidenced by Connells Maple Lee’s annual rose sale, which coincides with National Rose Month in June. Two-dozen premium rose arrangement for $69.99 (normally $89.99). A rose farm typically harvests its crop every six to eight weeks: conveniently, after the Valentine’s Day harvest comes the one for Mother’s Day. But while there’s another big crop of roses in late spring, there is not a corresponding holiday to absorb all those flowers. Our rose sale taps into that abundant availability, which makes roses less expensive for us and, by extension, for you, our customers. Connells Maple Lee’s primary rose variety is called Freedom, which makes a big impression with its deep color, size (flowers range from 5 to 7 centimeters across), and long vase life. No matter the variety, roses have similar characteristics. However, care requirements can differ whether the roses arrive in a vase, loose or in a box, as these care tips explain. Of course, with our annual rose sale, it’s a great time to give roses as a gift to someone else or to treat yourself. To join the kids club, click here. Whether you’re a planner or procrastinator, online or in-store shopper, you can expect the same high-quality product and customer service from Connells Maple Lee. We really shine at Valentine’s Day. It’s our busiest time, and we enjoy the challenge of rising to the occasion. If a customer buys flowers once per year, it’s probably for Feb. 14. And with matters of the heart, the pressure really ramps up to deliver in a special way, for lovers and florists alike. We handle a similar volume of orders during the Christmas season, but that’s over a month or longer. By comparison, the Valentine’s Day “season” squeezes a similar volume into several days. But behind the scenes, Valentine’s Day is months in the making, and it takes us thousands of miles from our stores. You see, we don’t just place a phone call and wait for roses to come to us. We go directly to the flower farms in South America, where we can see firsthand the crop that’s being grown just for our customers. This way we can make sure everything is to our satisfaction. If there are problems, then we have more time to correct them. Once the Valentine’s Day crop is harvested, it is flown to Miami, where it is inspected by U.S. customs officials. From there, we move the flowers to a refrigerated tractor-trailer for their journey to our Grove City distribution center. The flowers are either picked up by drivers from our stores or headed to another part of the building and our central design department. The demand is so great at Valentine’s Day that our stores simply can’t accommodate all the work. They get a big assist from central design, where a team of workers packs roses in boxes or turns them and other flowers into beautiful arrangements. Whether you give or receive Valentine’s Day roses, or both, we want to make sure you get the most out of them. In fact, with the right amount of care, you should be able to keep your roses looking just rosy for a week. Click here for specific care instructions, which differ depending on whether your roses arrived in a vase or loose in a box. Either way, it’s best to keep them cool and, of course, sufficiently watered. From the farm to your front door, we love making Valentine’s Day special for our customers. Thanks for letting us show you how.